Max Siedentopf's guerrilla art installation allowed Tate Modern visitors to zoom in on Roger Stirk Harbour + Partner's Neo Bankside housing from Herzog & de Meuron's extension. The temporary artwork was created as a response to Tate Modern being taken to court by residents of neighbouring Roger Stirk Harbour+ Partners-designed Neo Bankside development. 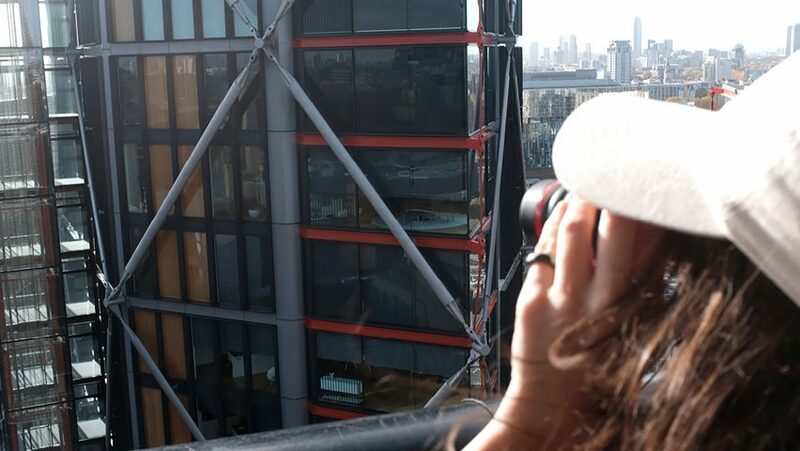 Artist Max Siedentopf put pairs of binoculars on the railings of the Switch House terrace "to help visitors to get a better and closer look" at the apartments, as part of his piece called Please Respect Our Neighbour's Privacy. "The past couple of times I have visited Tate Modern, there was not a single artwork that has as many people gathered in fascination than in front of the Neo Bankside flats," Siedentopf told Dezeen. "At certain moments of the day there are so many people around it that it almost resembles the crowd that always surrounds the Mona Lisa in Louvre." As part of the guerrilla art installation signs were posted along the balcony asking Tate Modern Visitors to "Please respect our neighbour's privacy", the phrase that inspired Siedentopf's title. "They uncannily looked like captions to the artwork," Siedentopf explained. "I love the irony of it - you have massive windows to show your fancy apartment but then no one is allowed to look inside." Herzog & de Meuron designed the sheltered outdoor walkway, which runs around four sides of Switch House, to give visitors to the Tate Modern 360-degree views over London. However, five claimant residents of the Roger Stirk Harbour+Partners-designed apartments have taken legal action as the viewing gallery "unreasonably interferes with their use of their flats," reported the Guardian. The high court hearing began on 2 November 2018. Defending the Tate at the hearing, Guy Fetherstonhaugh QC said the gallery's viewing platform was "part of an overall experience designed to engage people with the arts”. "Nick Serota, former director of the Tate, had a brilliant idea how to solve this debacle – just buy some curtains." Serota made the comments about curtains in 2016, when residents of the multi-million pound apartment blocks complained gallery-goers were spying on them. The hearing continues, with site visits and witness statements ongoing. Siedentopf hopes the high court will rule in favour of the art gallery. "I hope that in an ideal world a decision will be made that the Tate Modern declares the Neo Bankside flats as an official live performance artwork." Siedentopf did not ask the permission from Tate Modern to install the artwork. "I would say it's more of a don't ask for permission ask for forgiveness piece," he said, adding that he was keen to collaborate with the gallery to make the binoculars permanent. Tate Modern had not returned Dezeen's request for comment at time of publication.